The Q1200 Infa red heater from Eterna provides you with a practical and enery efficient heating solution with two heat settings, from 600W - 1.2 kW of powerful infared heat that is ideal for warming homes and bodies. Infa-red heat is a safe and energy efficient solution to home heating, and is perfect for areas where focused localised heat is required. Described as similar to the pleasant warmth of the sun, infared is becoming a much more widespread and sought-after heading method, as it warms the walls, furniture and bodies directly, and works much faster than heating via traditional air convection. Infared heaters also have the advantage of converting almost all energy directly into useful heat, and wastes very little, giving you an econonomical solution for heating in homes, workshops, restaraunt seating areas etc. 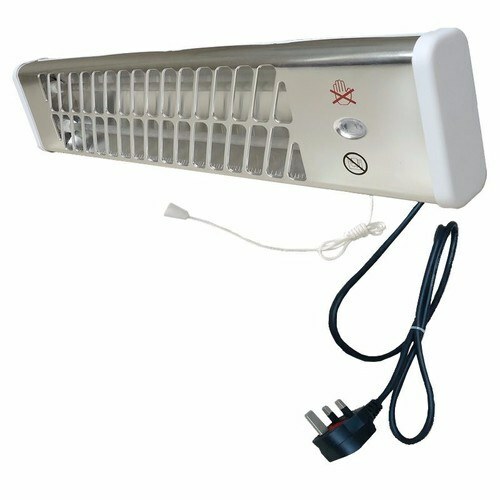 This heater features a wall mounted design, with an adjustable directional mounting bracket, pull-cord operation, a long 1.6m power cable, a neon power indicator, and is ideal for any use indoors where it can be fitted above 1.8m from floor level. Good product, well priced,Unfortunately very slow delivery about 10 days.